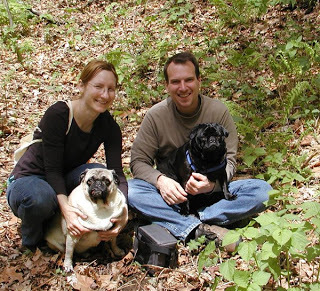 We headed out with Travis, Nicole and the innpugs to the old dirt stagecoach road off of Point Lookout Trail, a paved greenway trail near the Inn. 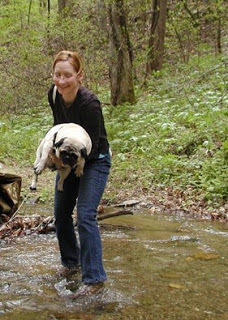 The weather was absolutely perfect for hiking and geocaching, with plenty of Carolina blue sky mixed with enough cloud cover to keep the pugs from overheating. 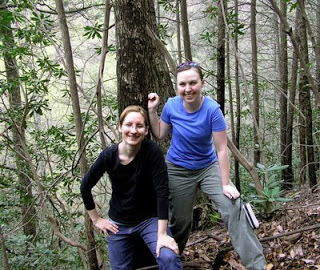 We were in search of two caches, one of which we had been unsuccessful in finding on a previous geocaching search in December. This time, with Travis and Nicole’s help, we (meaning Brigette, as Dave stayed down near the Swannanoa Creek with the innpugs) were able to widen the search area for the first cache, called the Cross Creek Climbing Cache, and we located it after about a half hour of scrambling up, up, up and all around the ridge and looking under every nook and cranny. 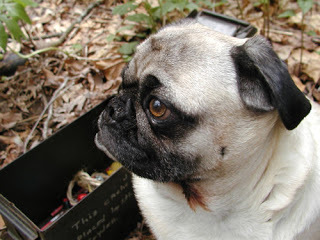 We then headed back down to Dave and the pugs and proceeded on to Spyder’s Cache, hidden further down the trail. 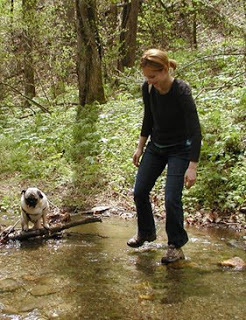 The walk to Spyder’s Cache was a beautiful hike in the forest and we were surrounded by the vibrant green of Spring. It almost felt like we were on a movie set…it just looked too good to be real. Spyder’s cache proved easier to find than the Cross Creek Climbing Cache, and we were able to rest a little before heading back. 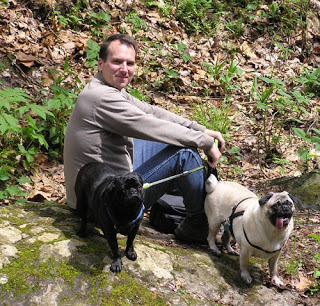 If you have the chance to hike this trail off Point Lookout Trail, we highly recommend it. 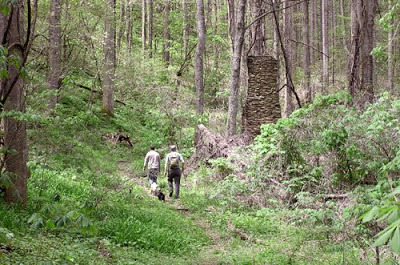 You’ll pass by large groupings of native evergreen laurel and other plants under the old forest canopy, with the sounds of Swannanoa Creek guiding you almost the entire way along the path. You’ll even see a couple of fields of kudzu (an invasive vine) that give the look of a primeval forest. Plus, if you’re a geocaching enthusiast, you’ll be rewarded with a couple of caches if you can find them! 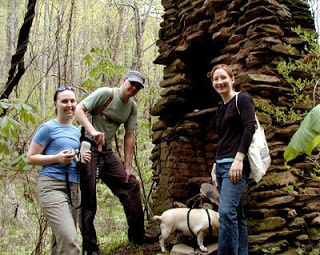 This entry was posted in Uncategorized and tagged geocaching, guests, hiking, innkeepers and innpugs, outdoors by Inn on Mill Creek. Bookmark the permalink.